Jordan Brand is expected to make a huge splashy next month with their Jordan Brand Holiday Collection 2011, which includes a much-improved edition of the Air Jordan 14. Aside from the “last shot” edition, the Air Jordan 14 is set to return in White/Sport Red-Black colourway, which will also be known as the “home bulls” edition. 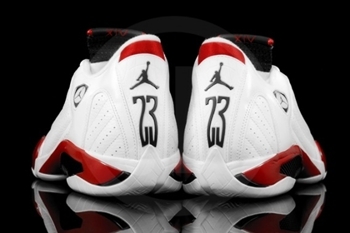 The shoe features an all-white leather upper paired with sports red accents on the midsole, heel tab, and tongue tab plus a touch of black on the Jumpman logo and tongue. Watch out for this one this Holiday Season and make sure to grab one!